When I was first writing my novel over ten years ago, I was buried in tons of research. My novel was based in 1896, right before the Philippine-American war which is barely a footnote in history books these days. 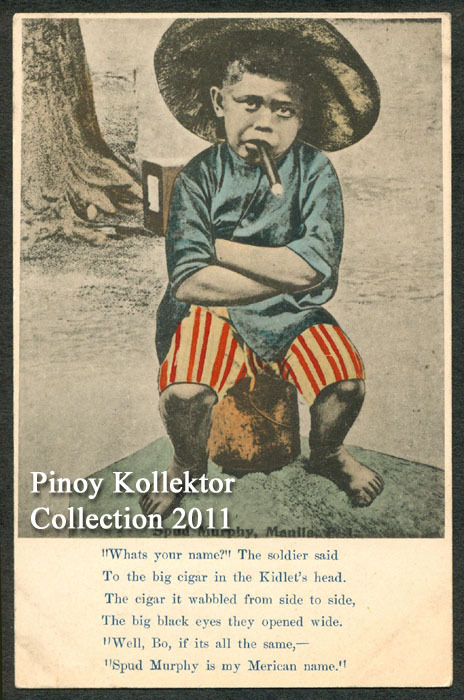 My protagonist was a daughter of a well-to-do Spanish tobacco baron, and during that time, the Philippines produced a quite mild cigar, compared to those produced by the likes of Cuba and the Dominican Replublic. The research that led me to the growing of tobacco opened a whole new world for me and before long, I had a collection of books on cigars, tobacco, and a small humidor with a humble assortment of Cohibas and that one Arturo Fuente that disappeared during a wild New Year’s eve party where the only trace of poor Arturo was but a fleeting kiss from a stranger (who had promptly smoked it first) to greet the new year before my designated driver promptly hauled me off home before I made a fool out of myself – but that’s for another blog post, I suspect. 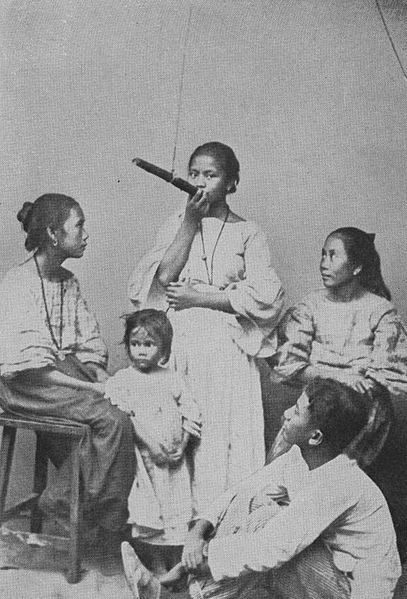 Smoking was huge in the Philippines. 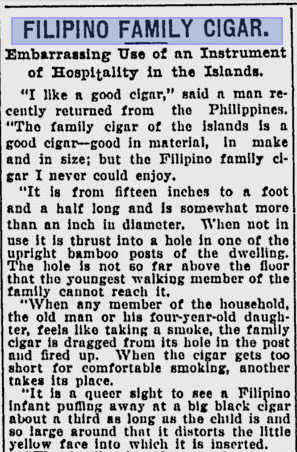 So huge that they had the Family Cigar hanging from the ceiling in some homes, according to this 1907 article from the Toledo Blade. Apparently, it was an “embarrassing use of an instrument of hospitality in the Islands,” according to the writer, especially when it is taken straight from the mouth of a family member and then offered to the guest.” Yuck. It’s been ten years since I’ve picked up the pages of that novel and I suspect I probably don’t remember what it was all about, especially its details. But it’s still the story that I want to write. Of course it’s not about tobacco. It’s what my protagonist’s family business is, a foundation that I need for my protagonist to be able to move around in a highly charged environment that was 1896 Philippines, when the Filipinos were restless under 300 years of oppressive Spanish rule, and the hopeful encouragement of Americans who really were itching to get into the colonialist pool. I grew up around smokers and so I have no problem with smokers – unless you smoke within ten feet from my toddler. But as a whole, I have no problem with smokers, nor writing about smokers and smoking. That’s why I’m writing this now. I still remember one of our nannies who rolled her own cigars from tobacco leaves my grandmother would purchase from the market each morning. And as my grandmother would hand them to Gertrudes, who lived till she was in her late eighties or early nineties, my grandmother would always remind her that ‘smoking is bad for you’ even as she supported the woman’s habit. It became a ritual neither women abandoned. And something that us children would never forget. No one actually knew Gertrudes’ age or her birthday. She moved in with my grandmother’s family when she was only a teen-ager and never left – and when she did to return to her own family to retire, her family barely remembered her and she returned to live with us, this time as a retiree and my aunt, her youngest ward, took care of her till she died. At her funeral, there were only us at the church. None of Gertrudes’ family showed up. 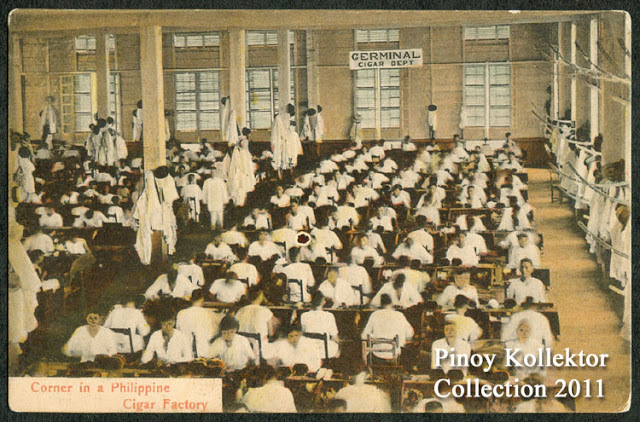 Anyway, here are a few more images I’ve found from Pinoy Kollector that proves just how huge smoking was, and still is, in the Philippines.